The use of mobile devices, specifically smartphones for access control has taken off over the past year or two, with expectations that its adoption will grow even more over the coming years. The benefits of using a mobile are many, such as having multiple access credentials on one phone and the fact that people are unlikely to lose or leave their phones lying around – or give them to anyone. Hi-Tech Security Solutions found out a bit more about the current state of mobile access, specifically as far as the hospitality industry in concerned, from Sonia Harding, lodging consultant at dormakaba South Africa. Hi-Tech Security Solutions: What are the benefits of using mobile phones as access control devices as opposed to traditional cards, tags etc.? Harding: A mobile device is a convenient and reliable system for both the hotel and the guest. • Through the use of a mobile device, guests don’t have to report at reception on arrival. They can simply proceed directly to their room and use their mobile device as they would their keycard. This removes the need to queue at the front desk or endure any delays or frustration. On arrival at the hotel, they proceed directly to their room and can access any common guest area on the property that would normally require a keycard. • Guests can use their mobile phones to check in online and their key is sent to their mobile device. One of the more commonly asked questions is, of course, what happens if the device’s battery dies? The answer is simple, the guest need only call into reception to collect a keycard that will allow them access to their room. • Guests don’t have to carry a keycard or tag with the them when they use the mobile device solution, which is convenient for both the hotel and the guest. With keycards, if they are lost or stolen, the guest needs to report to the front desk in order to get a new keycard. Not only does replacing these cards with a mobile credential save the hotel money – lost keycards are expensive – but it limits the security risk that comes with a keycard being lost – it can be picked up and used by anyone at any time. With the mobile device solution, this challenge is resolved. • The system integrates seamlessly with the hotel locking system and provides a cloud-based platform to secure the issuing and management of keys on mobile devices. Hi-Tech Security Solutions: How does the cost of mobile access solutions compare to traditional solutions? Is the management and on/off-boarding done from the same control software? Harding: As all of our locks are already compatible with BLE, there is no difference in the price of the lock. The only expense is the BLE antenna that is fitted on the inside of the lock. The cost is minimal and the client can upgrade their lock by simply adding the antenna. The hardware and operating software used to take advantage of the system are largely the same as legacy systems already installed by most hotels so the difference in costs there is minimal. There is a licensing fee for the use of the dormakaba Mobile Key app, however, if the hotel would like to make use of its own application, our system can be integrated into this. Hi-Tech Security Solutions: What changes need to be made to readers and/or sensors in order to cater for mobile credentials? Can readers be upgraded to cater for both mobile and traditional credentials? Harding: No changes are made to the lock readers as they work with radio frequency technology. The PC boards in our locks are already compatible with BLE, which means that the hotel can upgrade at any stage by simply buying the BLE antenna. When a valid Mifare keycard is presented to the RFID lock reader, the lock will respond and open. 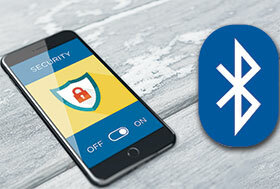 When a mobile key is presented, the Bluetooth antenna will pick up the key and, if it is valid, the lock will respond and open. Our lock operates with our Windows-based software system 6000 or a standalone system, and it will not have to be upgraded to accommodate the BLE technology. Hi-Tech Security Solutions: What are the latest products and solutions you have that make use of mobile credentials? Harding: All dormakaba locks that operate with the Windows-based system can accommodate the BLE technology, i.e. the Quantum series, RT Lock, MT RFID and more. The lock readers are RFID and the PC board in the lock is Bluetooth compatible. When a keycard is presented to the reader, it reads it via the RFID technology in the reader and when the mobile key is presented, the Bluetooth antenna responds.